I found this recipe in Clean Eating magazine a few months ago. Since then, I've fallen in love with goat cheese! 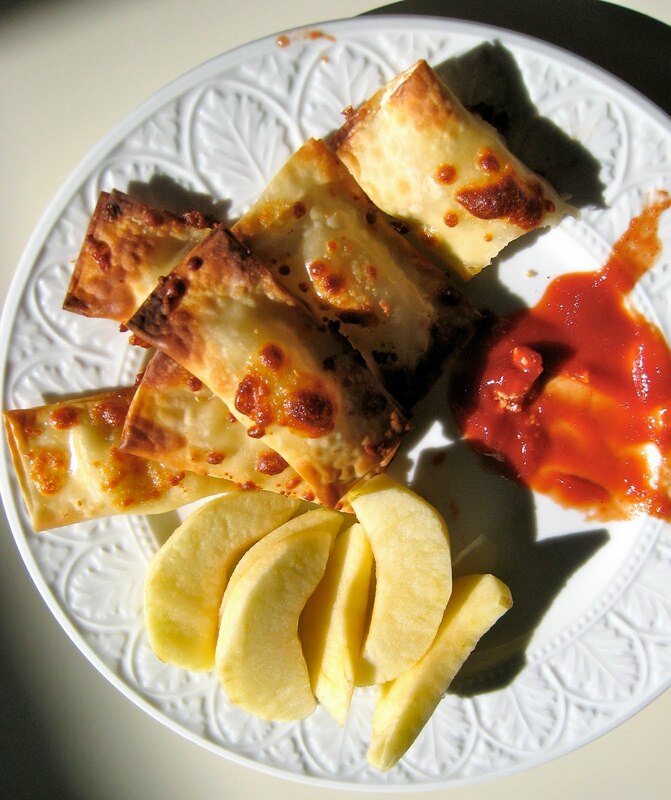 These tasty pockets are easy to make, although slightly time consuming. Try them and tell me what you think! 2. On a large cookie sheet, lay out as many wonton wrappers (see Product Review Site for brand recommendation) that fit. I often buy the egg roll sheets and then cut them into quarters. 3. Spoon on goat cheese in the middle of each wrapper. 4. Get a finger bowl of water. 5. Dip your finger in water. Trace the edge of the wrapper with water. Then fold and press the wrapper together. Do this until all the wrappers are shut. 6. Sprinkle all the wrappers with water and then sprinkle on parmesan. 7. Transfer to a fully heated stone or new greased cookie sheet. 8. Bake for about 8 minutes or until golden brown. My daughter and I like ketchup with them, but the original article suggested a red pepper dip: in a blender combine jarred roasted red peppers and sour cream until smooth. Add a little cayenne if you want a kick to it! We had these last night! Completely forgot the parmesan though. It's pretty crucial to proper crusting of the tops. I highly recommend this recipe!